4500 color illustrations, over 3500 new illustrations; almost 2000 color range maps; new mammal identification section with 60 common species. In 2013 Colombia became the first country to record a landmark 1900 species of birds, almost 20% of the world’s total. The figure continues to increase every year. 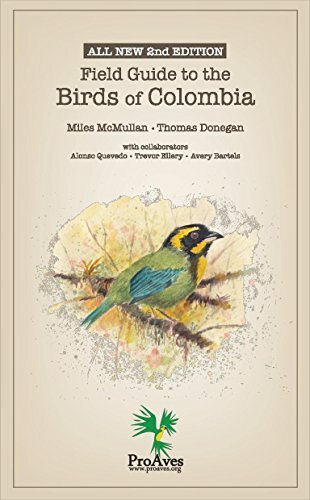 The first edition of “Field Guide to the Birds of Colombia” was published in 2010 by ProAves and was followed by a Spanish version, “Guía de Campo de Las Aves de Colombia” in 2011. These small field books were a new type of product in what was, at the time, a growing but uncertain market, but they proved a surprise success and they also helped to redefine what a field guide for complex tropical avifauna can be. This second edition has been fully updated, revised, expanded and almost entirely re-illustrated. However, the aim remains the same – to produce a comfortable book that fits in your pocket and can be consulted with a single hand; and to strip away the complexity of Colombia’s birdlife to offer a simple, accessible and fun tool that anyone can use in the field.